John Marston has a zombie problem. But zombies have a John Marston problem: John Marston's got a blunderbuss. At New York Comic-Con today, Rockstar Games is letting showgoers try Undead Nightmare, the last announced downloadable expansion to the company's hit western. This is the one with zombies and zombie horses, a combination of new single-player and multiplayer content. The Comic-Con demo is confined to a graveyard, where players can get a feel for hero John Marston's new enemies. They are zombies, the shambling kind and the sometimes fast-moving. They don't use guns but at least one stumbles and groans with an axe in his head. In the graveyard, Marston needs to kill zombies and burn coffins. His biggest new weapon for the task is the blunderbuss (not pictured here, sorry). Its single shots turn zombies to mist. Its ammo is re-stocked by scavenging the detritus of dead zombies. The Undead Nightmare zombies are unarmed but treacherous. They'll just give Marston the worst kind of hugs and punches. They pile on, making a zombie fight a closer-range battle than the bullet-trading fights of much of Red Dead. Marston can still use his Dead Eye slow-motion technique to help aim for vital zombie-destroying headshots, but the swarm of zombies is thick enough to make close fighting frequent. When Rockstar let me sample an Undead Nightmare graveyard battle, I was reminded that aimed shots from Marston at close range can trigger specially-animated kills. Against zombies, this happens a lot. The undead are all over our cowboy hero. As the tide turns for the living, the graveyard battle ends with a battle against a boss zombie of sorts. Undead Nightmare appears to have a darker and almost sickened color palette, adding a tinge of unease to the game's authentic western setting. Rockstar hasn't made zombie game before, but it doesn't feel weird to have John Marston fight the undead. Maybe that's because zombies are so prevalent in video games. But maybe it's because even this small piece of the Undead Nightmare pack looks, sounds and feels a little like a bad dream. It's creepy, the kind of creepy into which you'd want to take your blunderbuss. 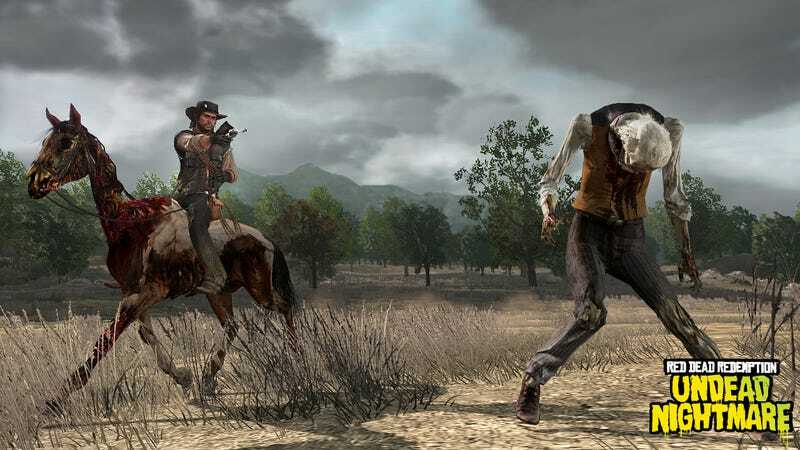 Undead Nightmare will be released as paid downloadable content for Red Dead Redemption on the Xbox 360 and PlayStation 3 some time this fall.